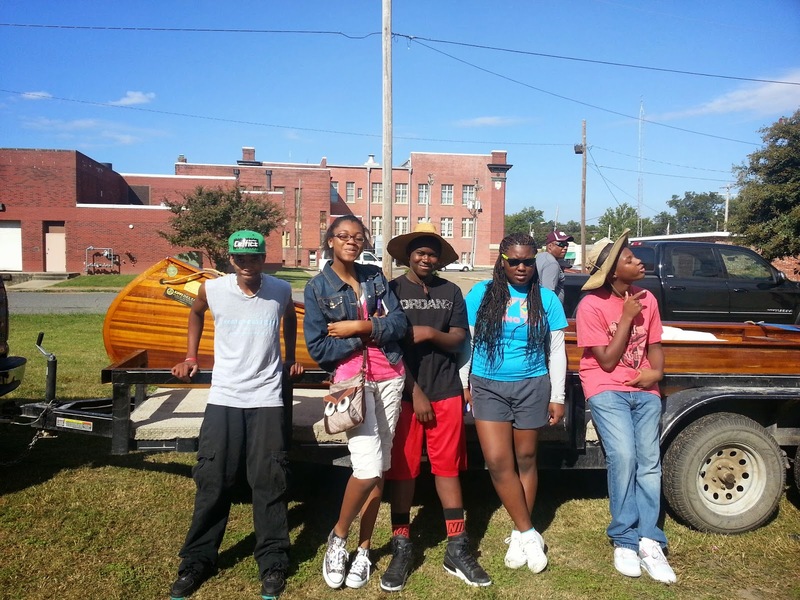 This past Saturday Griot River Arts students and staff had the privilege of canoeing on the Mississippi River with Quapaw Canoe Company in a handmade, wooden, 12 person canoe. The weather was perfect, the river was calm, and the company was wonderful. It was a truly blessed day that felt like a family vacation; made complete by an amazing lunch and breathtaking wildlife. We all learned teamwork skills and built friendships. Mark River Peoples was our guide as we started on the St. Francis River and paddled a 12 mile stretch of the Mississippi river, ending in a harbor in West-Helena, Arkansaw. In addition to our guide, we had two mighty Quapaws assisting with the trip, one of which was our very own Griot senior, Valencia Metcalf. Griot Youth Program Director, Emily Wisseman, and Griot Director of Development, Shelley Ricker, accompanied the five Griot students. We were especially privileged to have two of Mark River’s family members accompany us on the river, Earl and Charlotte. The day started out with a talk about the history of the river and the importance of protecting our fresh water supplies by Mark River and a visiting environmental activist. Once we were all piled into the beautiful wooden canoe with ample supplies and sunscreen, we started the morning by paddling along the banks of the Saint Francis National Forest and spotted several hawks and pelicans. We stopped for lunch along a beautiful sandy shoreline and were spoiled by the extravagant spread of delicious food that Mark River had packed for us. 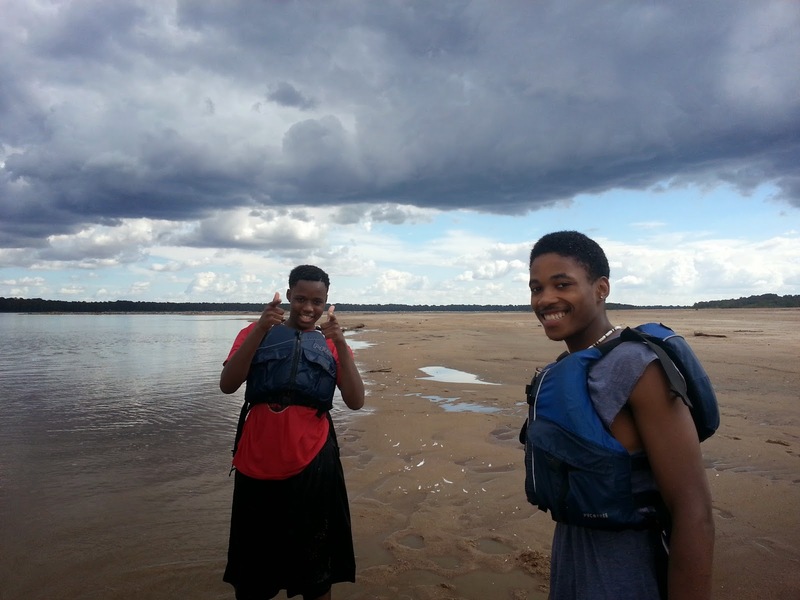 After stuffing ourselves with fruit, salmon, and cheese, the students played in the water by the canoe, wrote their names in the sand, and we all enjoyed the laughter and joyful squeals from the Griot students; James, Julius, Robyn, Valencia, and Chris Riley as they splashed, swam, and dug their toes in the Mississippi mud! Paddling was made even more enjoyable by renditions of row, row, your boat by Charlotte and the great attitudes and hard work of all. Our final stop started with a breath-taking scene of hundreds of brown pelicans taking flight from a sandbar in the middle of the river. 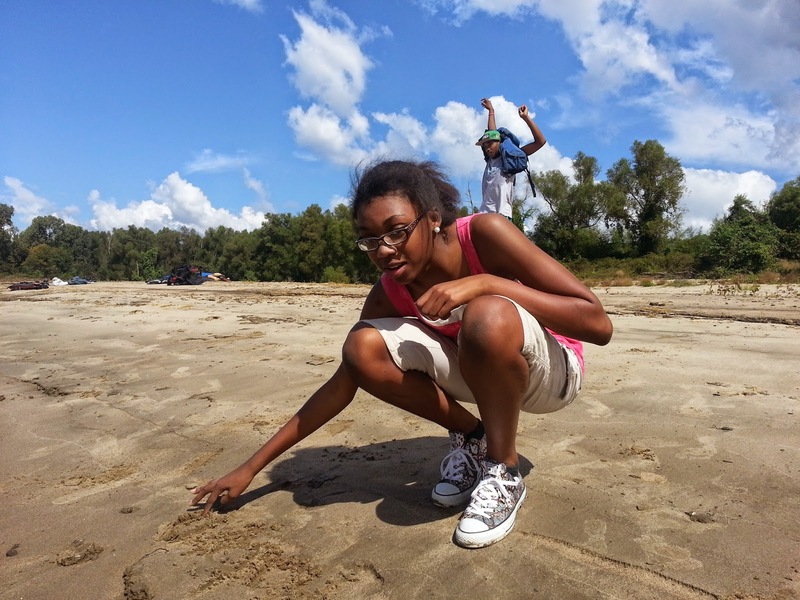 Young and old enjoyed finding fossils, shells, and colorful rocks along the long sandbar. I could see the teamwork and communication skills building between our students as they worked together to paddle and help each other in and out of the boat. This is the kind of trip that is invaluable for its ability to pull students away from their daily routine and challenge them to overcome their fears and work hard at something new. Most of our students had never been on the Mississippi River, even though they have all lived just a few miles away their entire lives. I had the delight of watching out students grow dramatically in teamwork, communication, appreciation of nature, and friendship over the course of the day. Our amazing day on the river ended with positive comments from all. 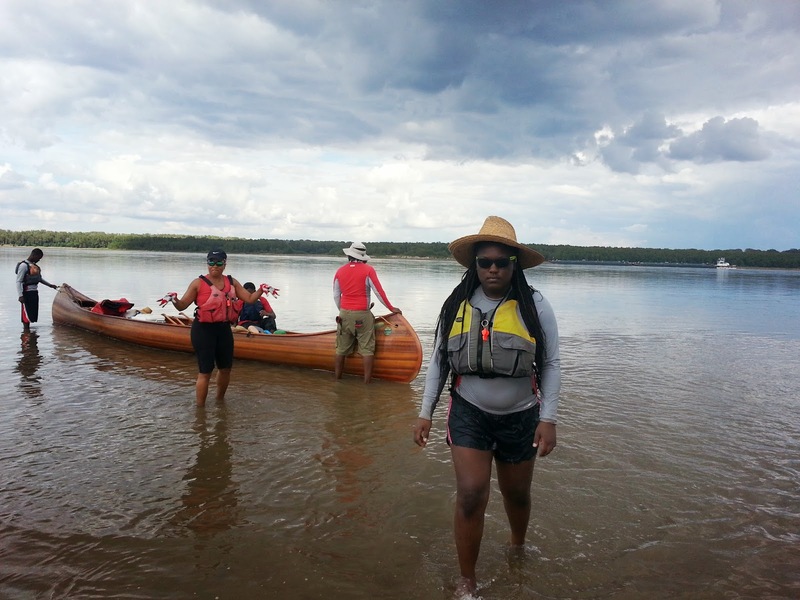 Robyn (Griot River arts and dance major) reported that “this is the most fun I have ever had in nature!” Thank you to Quapaw and Mark River for making such a wonderful trip possible! The Griot Youth Program creates a community of students actively engaged in making their community and world a better place through the arts and community service. We provide excellent teaching in various arts mediums, encourage a love of learning, and have a thriving mentoring program.